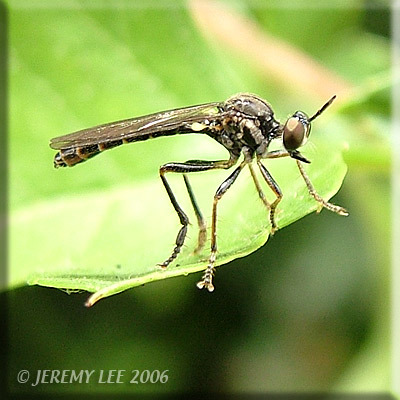 Dioctria baumhaueri, more commonly known as a Robber Fly, is a widespread, small to medium-sized robber fly having mainly orange legs with dark stripes along the top of the fore and mid femorae. It is usually encountered in scrubby grassland and at woodland edge. Ichneumon wasps apprently constitute a good proportion of the prey.